Another ‘ancient’ DNA find, much harder to refute, should logically be death-knell of ‘millions of years’. The researchers carefully followed procedures to avoid the possibility of contamination. The authors also examined the salt crystals under a microscope to check for fractures that could allow contamination of the crystals after they were originally formed. In crystals with no fractures, they identified brine inclusions, which they quickly cut out with a laser under sterile conditions. They checked that the procedure did not destroy DNA. As further evidence that the DNA did not come from contamination, the scientists compared the sequences of DNA ‘letters’ from the salt inclusions with those of the same gene in the most similar modern bacteria.8 They were different—suggesting that the DNA did not come from contamination. Also, the same laboratory procedures were applied to all samples, from different parts of the world (Poland, Thailand and USA), yet different sources gave different DNA sequences and one of the salt crystal sources failed to yield any DNA. Check samples were also run that were treated the same as the salt crystal inclusions—ones with no known source of DNA, to check that none was inadvertently added, and ones with DNA added, to check that the DNA was not destroyed in the processing. Furthermore, the researchers found DNA from types of bacteria that would be expected in salt inclusions—such as ‘salt-loving’ bacteria and bacteria that tolerate a wide range of environments. This is all good evidence that the results are not due to contamination. This paper could also lend some credibility to the other research that has detected DNA from supposedly ancient fossils. ‘There are well known and respected people who believe that DNA can’t survive more than 100,000 years or so. Its basic chemistry means that the bonds in it fall apart.’ But such experts had based their work on DNA kept in relatively dilute liquids and little work had been done on how DNA survived in extremely strong salt solutions, he said. ‘We think that salt has particular preservation qualities,’ he added. However, the chemists who deny that DNA can last for eons have considered the possibility of remarkable preservation conditions, and, even then, they still rule out the faintest possibility of ages in the millions of years for DNA. 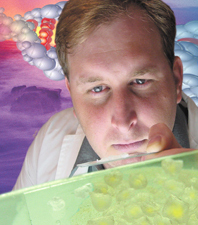 One group of chemists insists (with sound reasons) that DNA can’t last millions of years. Another group of scientists has presented solid evidence that they have found DNA in layers which evolutionists/long-agers believe to be 425 million years old (with sound reasons that the DNA was in the layers from the time they formed). The obvious way to resolve these conflicting views is by realizing that the ages attributed to the layers containing the salt crystals are in error; the crystals are only thousands of years old! In short, the presence of DNA in this ‘ancient’ salt is about as close as one can get to scientific proof that the ‘millions of years’ scenario is fiction. Interestingly, the DNA sequences differed from those of known bacteria by less than 2%, with many by less than 1%. Considering the supposed age of the DNA, up to 425 million years, this must be surprising to evolutionists, because of the amount of evolution that has supposedly happened ‘since then’—such as the development of virtually all land-dwelling vertebrates and plants. And bacteria, with their large populations and short generation times, should evolve much faster than plants and animals. In other words, because of their belief in the ‘millions of years’ ages, the authors expected that there would be much greater differences in comparing ‘old’ bacterial DNA with modern bacterial DNA. So, as a solution to this conundrum, they propose that the molecular clock (the mutation rate) must have run much more slowly than expected. Of course if the fossil DNA is not millions of years old, but thousands, there is no mystery. However, things are worse than that for the molecular clock idea. The samples from Poland, Thailand and the United States are dated at 11–16, 66–96 and 415–425 million years old, respectively. But many of the DNA sequences from all three sources group together! If evolution and its millions of years had any truth to them, the degree of difference compared to modern bacteria should run with the age of the sources—the oldest should be the most different. This is not the case. The molecular clock cannot be manipulated to account for this. The data are more consistent with the bacterial DNA being preserved during the year-long global Flood of Noah, or, in other words, all at more or less the same time. This would explain the incredible (for the evolutionist) similarities in the sequences. The real data of these scientific discoveries makes more sense in the Biblical framework of history. This involved the creation of various kinds of organisms in the beginning, and the global Flood creating lots of fossils in a short time—all within a total timeframe of thousands of years. Wieland, C., DNA dating: fascinating evidence that the fossils are young, Creation 14(3):43, 1992. Return to text. Reviving ancient germs? Creation 18(1):9, 1996. Return to text. Oard, M.J., Aren’t 250 million year old live bacteria a bit much?, 27 June 2002. Return to text. Lindahl, T., Instability and decay of the primary structure of DNA, Nature 362(6422):709–715, 1993. Return to text. Pääbo, S., Ancient DNA, Scientific American 269(5):60–66, 1993. Return to text. Monastersky, R., Dinosaur DNA claim dismissed as a mistake, Science News 148(23):373, 2 December 1995. 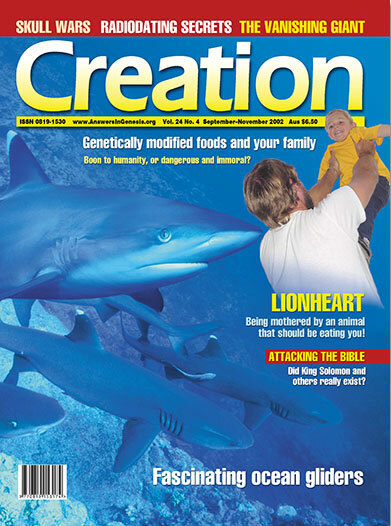 Dino DNA claim debunked, Creation 17(3):7, 1995. Return to text. Fish, S.A., Shepherd, T.J., McGenity, T.J. and Grant, W.D., Recovery of 16S ribosomal RNA gene fragments from ancient halite, Nature 417(6887):432–436, 2002. Return to text. This can be done by searching and matching databases of gene sequences available on the Internet. Return to text. Noble, I., DNA traces found in ancient rock, BBC News (on line) 23 May 2002. Last accessed 27 June 2002. Return to text. We agree that many of the sequences isolated would be from related organisms—descendants of the original created kinds due to mutations and genetic transfer between bacteria in the time between the Fall and the Flood. Return to text. Walker, T., The way it really is, pp. 20–23 [this issue]. For technical treatment, see Woodmorappe, J., The Mythology of Modern Dating Methods, Institute for Creation Research, El Cajon, California, 1999. Return to text. Wieland, C., A shrinking date for ‘Eve’, CEN Tech. Journal 12(1):1–3, 1998. Return to text.